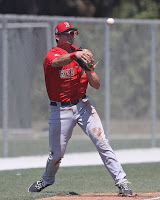 The SoxProspects crew has been in Fort Myers on the backfields gathering a ton of content, including video from batting practice, infield work, and minor league games. Be sure to check out the SoxProspects.com Twitter page. Mike Andrews, Chris Hatfield, Ian Cundall, and James Dunne also have content on their own accounts. Some highlights from the trip include a couple Bobby Dalbec (pictured) home runs, one to center and one to right, Tanner Houck utilizing his low three-quarters arm slot during a dominant performance, Danny Diaz going yard a few times during batting practice, and 2018 first-round pick Triston Casas taking some batting practice swings. It looks like Marco Hernandez will stay in extended spring training to continue his rehab. Nick Decker, Antoni Flores, and Nick Northcut will also most likely begin the year in extended spring. Another interesting tidbit from the back fields is that Michael Chavis did not play any third base over the past few days, sticking to just first and second, while Bobby Dalbec has only played third. Make sure to check out Chris Hatfield's appearance on Downtown with Rich Kimball as he gives insight on the trip to Florida and the state of the Red Sox system. If you wish to join SoxProspets' generous Patreon members, sign up here and get access to exclusive content. Jen McCaffrey of The Athletic (subscription required) wrote about Durbin Feltman and the high expectations that have been placed on him. He was drafted last year, but manager Alex Cora says there is a chance that Boston might need him this year. Christopher Smith of MassLive.com also wrote about Feltman and how he needs to clean up his delivery. Sea Dogs play-by-play man Mike Antonellis wrote a column after his 14th consecutive year covering the Sea Dogs in spring training where he mentions a few Sea Dogs' promotions for 2019. Major League Baseball announced that right-handed pitcher Chase Shugart was suspended 50 games for a second positive test of a drug of abuse. He was a 12th round pick in 2018. The Red Sox also announced that Juan Centeno and Gorkys Hernandez were reassigned to minor league camp, Bobby Poyner and Marcus Walden were optioned to Pawtucket, and Darwinzon Hernandez was optioned to Portland. Here is the list of minor league players who have appeared in spring training games since the last Fort Report: Nick Lovullo, Mike Miller, Joseph Monge, Jeremy Rivera, Jantzen Witte, Chris Madera, Ryan Fitzgerald, Adam Lau, Andrew Schwaab, Daniel McGrath, Hunter Smith, Aneury Tavarez, Jarren Duran, Kervin Suarez, Jagger Rusconi, and Jenrry Mejia.